In Texas, during the years following the Civil War, a 75-year-0ld printer who has lost his business, a casualty of war and its aftermath, travels the western part of the state giving readings from newspapers. He rides into town, posts notices of his performance, and collects a dime from everyone who attends in an old paint can. All he does is stand in front of the crowd and read a selection of stories from several recent newspapers. Did this really happen? Is there historical evidence for such a thing? There are no mention of this in the notes from the author at the end of the book and most readers will be more interested in other aspects of this novel, but I hope this really is true. It could be. 1870 was still the “wild west” in America. Performances of any kind were almost always welcome in the smaller towns and settlements. Even today people are willing to pay just to hear other people read something to them. But for me this was a strange element to find in a western. I was reminded of Hilary St. John Mandel’s recent novel Station Eleven about a travelling Shakespeare company in a post-apocalyptic future. 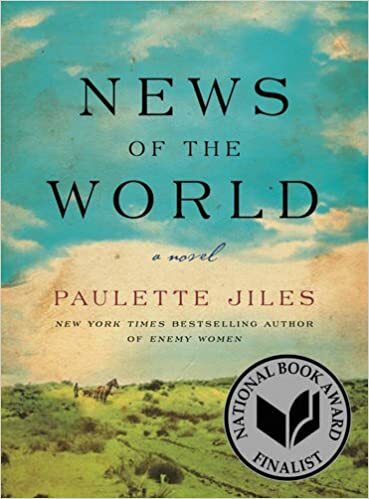 Paulette Jiles’s reader travels through a post war Texas facing a series of threats not unfamiliar to readers of dystopian fiction: overly friendly townspeople, a hostile gang of slave traders, an Indian attack, a dangerous city. The story could easily have become The Postman. What makes News of the World great are two characters and some wonderful writing. Besides Captain Kidd, the reader/printer mentioned above, there is Johanna Leonberger, a ten-year-old girl recently “rescued” from the Kiowa tribe who have had her since they kidnapped her at age six. Johanna is wild, afraid of nearly everything she sees in what to her is a new world. She remembers almost nothing of her white family. She wants only to return to the Kiowa whom she considers her family. It is very difficult for her to trust the white man whom she has been handed over to. Captain Kidd has taken the job of returning Johanna to her family, an aunt and uncle several hundred miles to the south. Along the way he and Johanna form a very tight bond. This story, how Johanna comes to trust Captain Kidd and how Captain Kidd comes to see Johanna as a daughter, give News of the World its heart. I know I tend to get lost in inter-texual linking but I kept thinking of the 1998 Brazilian move Central Station about a bitter retired school teacher who takes an orphaned boy across Brazil to his father’s home. It’s a wonderful movie by the way. The performance by Fernanda Montenegro is one of the best you will ever see. She lost the Oscar, by the way, to Gwyneth Paltrow who won it for Shakespeare in Love. There have been many stories about captive children returned from Native American tribes. Some date back to just shortly after the arrive of Europeans in North America. From what I’ve read they all seem to have certain things in common. The children always adopt the tribe as family. They forget white culture altogether including their language some in just a few years. They do not want to return to white culture. They never see their native culture again. They never completely re-adapt to their families. I’ve only seen this story in “case studies”–stories about one person both fiction and non-fiction. I’d love to find a broader study on this topic. Is this pattern the result of differences between how native people live and how white culture at the time lived? Or is it something about the nature of children who experience abduction through extreme violence. Very often they have seen their parents and siblings killed as was the case with Johanna in News of the World. I was expecting this story to end badly. As I got closer to the end I began to fear what would happen to Johanna and to Captain Kidd for that matter. Over the course of the novel I became very fond of both of them. All I’ll say here is that there was a happy ending for both, one that was completely believable and satisfying. Finally, a word about the writing. Not so much a word as a quote. You can judge for yourself. She put down the doll and shouted at the Indians with her hands around her mouth. What could she possible think would happen? That they would come for her? She was shouting for her mother, for her father and her sisters and brothers, for the life on the Plains, traveling wherever the buffalo took them, she was calling for her people who followed the water, lived with every contingency, were brave in the face of enemies, who could go without food or water or money or shoes or hats and did not care that they had neither mattresses nor chairs nor oil lamps. They stood and stared across the water at her like creatures of the sidhe, wet and shining in every flash from overhead. They stood among their jack strawed tipi poles heaped on horses, drenched children gazing at her out of buffalo robes on the travois, the men ahead and at the side with their weapons wrapped in whatever would keep them dry. One of them shouted back over the water. The lightning made them appear in every detail like an intaglio and then disappear and the reappear again. I’ve gone on about News of the World long enough. I loved it. Go read it it. I like your inter-textual linking. You have gotten me interested in this one, which I’d seen but passed over. I’ll be honest, I think I picked it up at my local library because I liked the cover and it’s kind of short. I needed a grown-up book I could read in a couple of days. This one is most definitely somewhere in my top three books of 2016…still deciding on the exact order. Was shocked when I was the only one who turned up at their table to meet them after their session ended. I purchased the other author’s book and had it signed, and then after speaking with Jiles for a few minutes, I was pleasantly surprised to be offered an ARC of the book. Since she only had half a dozen copies with her, I was even luckier than I realized at the moment. Saw her again in Austin at the Texas Book Festival but did not get a chance to speak with her – the book was better known by then and more people were wanting to speak with her. I was hoping you would comment on this book. That’s a great story. I’m glad this book has been a hit. It deserves a wide readership. I think it’s terrific. Of course, we don’t use odd medical concoctions these days. 😉 I’m starting to think this form of news deliver was probably more accurate than what we have now.